An arthropod is an invertebrate that has an external skeleton, a segmented body, and jointed attachments called appendages (wings, mouthparts, and legs). Arthropods have open circulatory systems - the blood leaves the blood vessels and bathes the internal organs. Most arthropods reproduce sexually. Most arthropods have internal fertilization - sperm and egg unite inside the body of the female. Exoskeleton (outer skeleton) protects the animal and helps prevent evaporation of water. 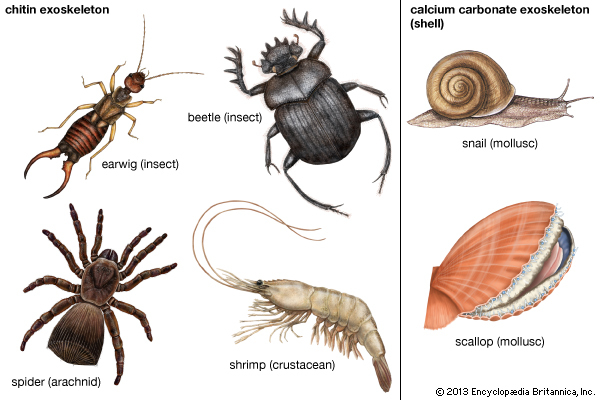 Arthropods were the first animals to move out of water and onto land, and their exoskeletons probably enabled them to do this. Arthropod exoskeletons are made of a material called chitin. Chitin is made of long molecules that are built from many smaller building blocks, like links in a chain,. Long-chain molecules like chitin are called polymers. As an arthropod grows larger, its exoskeleton cannot expand. Molting - arthropods solve this problem by occasionally shedding their exoskeletons and growing new ones that are larger. 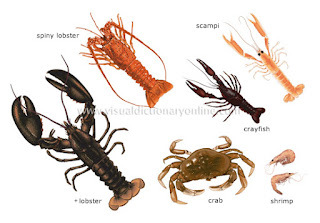 A crustacean is an arthropod that has two or three body sections and usually three pairs of appendages for chewing. Crustaceans always have five or more pairs of legs; each body segment has a pair of legs or modified legs attached to it. Crustaceans are the only arthropods that have two pairs of antennae. Most crustaceans, such as crabs, barnacles, and shrimp, begin their lives as microscopic, swimming larvae. Crustacean larvae develop into adults by metamorphosis. Crustaceans thrive in freshwater lakes and rivers, and even in puddles that last a long time. And also in deepest parts of oceans, in ocean currents, and along coastlines. Crustaceans obtain food in many ways. Many eat dead plants and animals. Others are predators, eating animals they have killed. An arachnid have only two body sections. The first section is a combined head and chest. The hind section, called the abdomen, contains the arachnid's reproductive organs and part of its digestive tract. 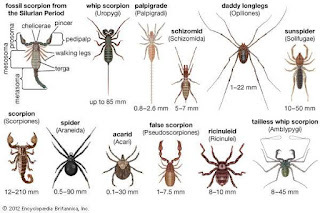 Arachnids have eight legs, but no antennae. They breathe with organs called book lungs or with a network of tiny tubes that lead to openings on the exoskeleton. All spiders are predators, and most of them eat insects. Spiders have hollow fangs, which are organs that inject venom into prey. Spiders venom turns tissues of the prey into mush. Later the spider uses its fangs like drinking straws, sucking in the mush. 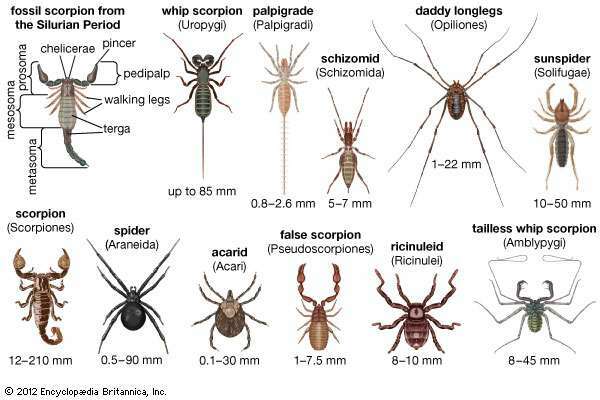 Tiny arachnids called mites are parasites. Mites are everywhere. Ticks are parasites that live on the outside of a host animal's body. Scorpions, which live mainly in hot climates, are also arachnids. At the end of its abdomen, a scorpion has a spinelike stinger through which it injects venom into its prey. 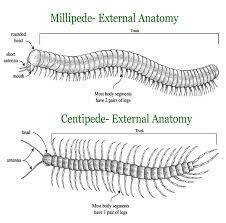 Centipedes have one pair of legs attached to each segment. Centipedes are predators with sharp jaws. They inject venom into the smaller animals that they catch for food. Millipedes have two pairs of legs on each segment. Most millipedes are herbivores that graze on partly decayed leaves. When they are disturbed, millipedes can curl up into an armored ball and squirt an awful-smelling liquid at a potential predator.